Lawyers have filed an appeal challenging the dismissal of a lawsuit that objected to Baltimore’s use of non-disclosure agreements in police abuse cases. U.S. District Judge Marvin J. Garbis ruled last November that Baltimore Brew lacked standing and that Ashley Overbey waived her First Amendment rights when she signed a 2014 non-disclosure agreement with the city. These “gag provisions” used by the city are inherently unconstitutional, wrote attorneys for the American Civil Liberties Union of Maryland and Crowell & Moring, who filed the original case on behalf of Overbey and The Brew last June. “The questions for this Court on appeal go to the core of the First Amendment and the foundational idea that government is not like private parties,” wrote the attorneys in a brief filed last night with the U.S. Court of Appeals for the the Fourth Circuit. “Our whole constitutional heritage rebels at the thought of giving the government the power to control men’s minds,” they wrote in the 65-page brief. In the original complaint, Overbey and The Brew argued that the city’s practice of requiring silence from alleged victims of police abuse in exchange for cash settlements violates the First Amendment and prevents news organizations from reporting on police practices and misconduct. Fearful of jeopardizing their financial settlement, victims refuse to be interviewed about their experiences. The suit further alleges that city officials illegally withheld half of Overbey’s $63,000 settlement because she described her case on a newspaper blog. Overbey and her mother were arrested. Charges were later dropped by the State’s Attorney’s Office. As a result of her public comments, the city gave Overbey only half of the agreed-upon settlement. The settlement agreement that Overbey subsequently signed, on advice of her attorney, included the gag provision. Violation of the gag provision gave the city the right to withhold 50% of the settlement proceeds. Unknown to Overbey and before she received her settlement proceeds, the Baltimore Sun published her name, mug shot and settlement amount. Included in the article were quotes from Nilson “pinning the blame on Overbey,” characterizing her disposition as “hostile” to the responding police officers. Responding to online commenters accusing her of being greedy and a “huckster,” Overbey posted multiple responses. “I am the woman who this article is talking about AND THE POLICE WERE WRONG! !” she wrote, responding to one of the commenters. As a result of her public comments, the city gave Overbey only half of the agreed-upon settlement amount of $63,000. In the appeal, the plaintiffs defend a substantial portion of the original complaint citing a history of civil rights infringement in Baltimore policing, citing the 2016 Justice Department report on the Police Department specifically. 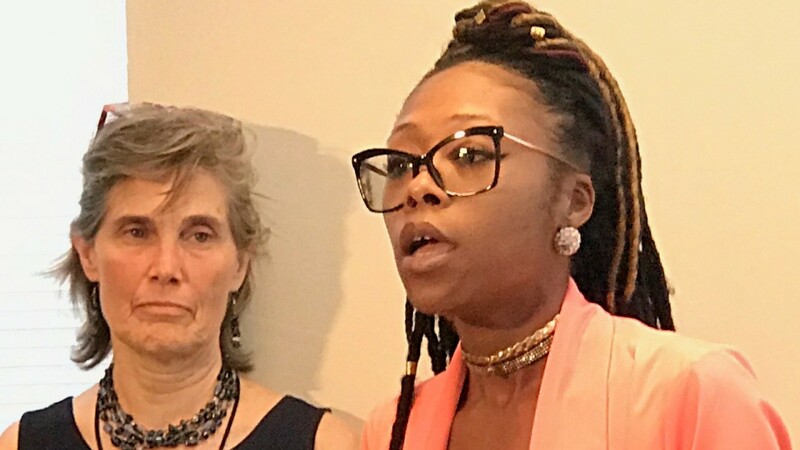 They note the power imbalance in the settlement negotiations, describing Overbey as a young black woman struggling to feed her family while the lingering online notation of her arrest in this case impeded her ability to find a job. “The City will maintain that this case is a garden-variety contract claim. The Court should not be swayed,” they argued. “Whether it is for $1 or $31,500 or millions of dollars, government may not threaten to penalize nor actually penalize its citizens for speaking truth to power,” they wrote. The appeal also disputed the claim that The Brew lacks standing. “A media entity, such as the Brew, has alleged in a well pleaded complaint that it routinely reports on the subject of the settled lawsuit [and] has standing in its own right to challenge on First Amendment grounds the constitutionality of the non-disparagement and gag policy as it applies generally,” the lawsuit argues.